Tip: Need more information about how subchapter S corporation taxation works before clicking the Buy Now button shown below? Click here: www.scorporationsexplained.com. 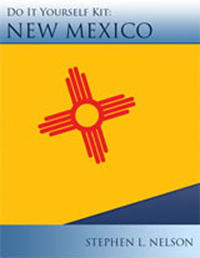 The Do-It-Yourself New Mexico S Corporation Kit is approximately 20pp in length. The document describes a limited liability company’s legal and tax characteristics and then provides step-by-step instructions for preparing the LLC formation documents and submitting the formation documents to the state of New Mexico. The “Do-It-Yourself New Mexico S Corporation Kit” was written by Seattle tax accountant Stephen L. Nelson. Nelson is the author of more than 150 books including the bestsellers Quicken for Dummies and QuickBooks for Dummies. In fact, Nelson’s books have sold more than 4,000,000 copies in English and have been translated into a dozen other languages. Occasionally an adjunct tax professor teaching S corporation tax law at Golden Gate University's graduate school of taxation—the nation’s largest graduate tax school—Nelson has an MBA in finance and an MS in taxation.